Praveen Pathiyil’s Forecasts: Are we still in the correction phase? Let us look at the Nifty chart first on a larger time frame before we proceed on in understanding what is going to happen in the next 2-3 days. Let us look at the main picture first. Looking at the main picture, it is very clear that we are still in the final leg of this correction. This could take more time before we break out of this correction. The reason why it is taking more time in getting us out of the correction zone is very simple; this correction is actually an accumulation phase. Looking very closely at the stocks of the broader market, one can understand one thing that people are accumulating good stocks on a daily basis taking leverage of the ongoing correction that we are witnessing. Though the broader markets may be moving down with each passing day, we find good stocks which could move up once the markets turn up are finding more accumulation rather than distribution, which we usually see in any correction phase. In short we find smart money moving from the not so fundamentally strong stocks to that of fundamentally strong stocks. Looking at a minor time frame of Nifty chart, one thing is for sure that this zig zag move would continue further and this will take even more time than what we were even thinking of. 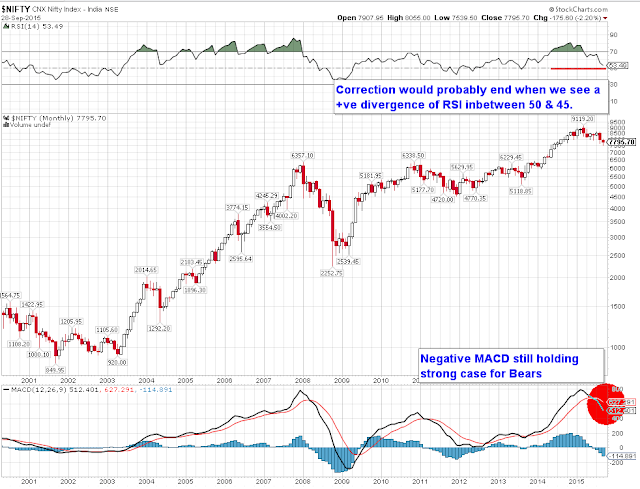 Technically speaking on the technical parameters of this daily chart one could observer, as we have indicated earlier this month, the RSI really did turn down after hitting the 50 mark and on the MACD indicator it is giving a kind of convergence and it could turn down very soon starting a new sell off. The immediate targets that I am looking out for on the Nifty, on the downside is 7540 and 7460. These are the two levels that we are keenly watching out on the downside. At the same time we are looking out for 8100 on the upside. This zig zag zone could probably drag Nifty further down in the next two sessions. Especially having Governor’s action round the corner, I strongly feel that nifty has more potential to move downwards. Considering all these, I suggest rather than betting on the zig zag moves, to start accumulating stocks which are really really strong and wait patiently for the correction to wind up. Once we start moving on the upside, we could gain wealth many times over investment. 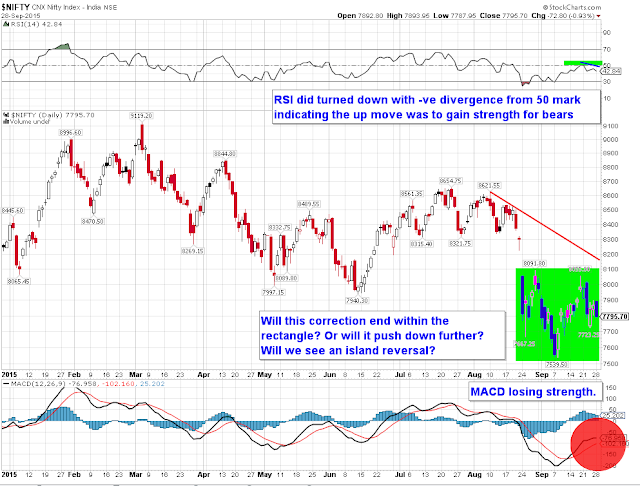 Once the correction ends, the target that I am looking for on nifty (on the upside) is around 14,000. This means that real good stocks could fetch you 5-6 times of what you have invested over the next couple of years. So be patient, start accumulating very good stocks rather than falling prey to this zig zag move of Nifty. Stay invested, be patient and enjoy the fruits of the markets. Intermediate term Trend: Trending on the downside with immediate supports at 7540 and 7460. Short term Trend: Trending Down. The trend will not change until we close above 8100, which means 8100 would act as SL for those who are short in Nifty.